Sleep. It’s kind of a weird requirement is it not? Once every 24 hours the body requires us to lie down for anywhere from 7-9 hours in order for us to ‘reboot’ for the next day and go about our daily lives. Some of us tend to think that sleep is a waste of time, it’s ‘for the lazy and unsuccessful’ or they think ‘I can sleep when I’m dead’, which you will learn could be sooner rather than later if we don’t start paying more attention to our nightly zzz’s. So, what is sleep? and why is it so very important to our health and overall sense of well-being? When we sleep, there’s is a co-ordinated stepwise pattern that occurs in the mind, almost like a computer system doing a ‘shutdown and update’ so we can function as best we can. That’s amazing! Let’s dig into the research a little further to find out exactly what is happening at each stage so we can walk away with a bit more understanding on the importance of each phase. 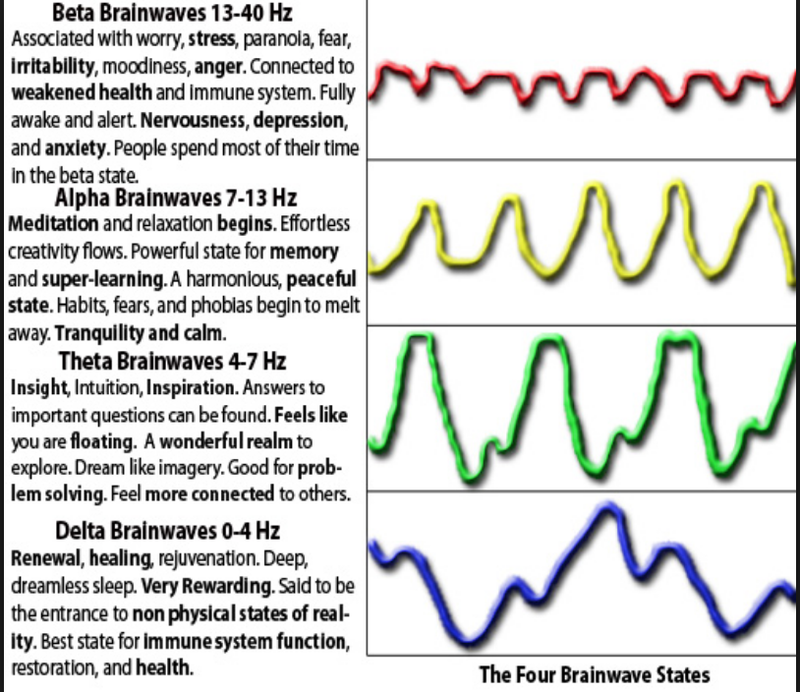 First, it’s helpful to know that when we’re awake we’re mostly in what’s called the Beta brainwaves state. As the graph illustrates, this is associated with alertness, concentration and learning. Higher levels of anxiety, fear and stress are also associated with beta which is where we spend most of our time. Whilst awake, we may also experience some Gamma brain wave activity which is like being in ‘The Zone’ or getting yourself into a ‘peak state’; that feeling like you can achieve anything. We spend most of the day in beta and if we’re lucky and not too tired from too many rubbish sleeps we might have moments of gamma. Then we take ourselves offline, hopeful for at least 6 hours of sleep before we’re up early to do it all over again. So, what happens when our head hits the pillow? Stage One & Two: Alpha or the meditative state begins. this is where the brain begins to slow down, more rhythmic brain waves are produced and your eye movements slow down. This introduction to sleep (or meditation) is relatively brief 5-10 minutes. Here, you are in light stage, which means that you’re somewhat alert and can be easily woken/aroused. When alpha brain waves begin, the parasympathetic nervous system kicks in, (rest and digest mode) shutting off the fight or flight sympathetic nervous system (fight or flight mode). Changes with your thyroid and stress hormones start taking place as we go into alpha. It's also normal for a person to experience "hypnic jerks," also known as ‘sleep starts’ in this phase (2). This is very closely followed by Theta brainwave activity. During this stage, the brain produces sudden increases in brain wave frequency known as sleep spindles. Then brain waves slow down. If you were to schedule a “power nap” you’d want to wake up after this stage of sleep. Stages Three & Four: The beginning of deep sleep, as the brain begins producing slower delta waves, which is the deep anabolic kind of dreamless sleep that we're really, wanting to spend an ample amount of time in. You won’t experience any eye movement or muscle activity. At this point, it becomes a little harder for you to be awakened, because your body becomes less responsive to outside stimuli. The brain produces even more delta waves and you move into an even deeper, more restorative stage of sleep next. This is when the body repairs muscles and tissues, stimulates growth and development, boosts immune function, and builds up energy for the next day. Rapid Eye Movement (REM) Sleep: You generally enter REM sleep about 90 minutes after initially falling asleep, and each REM stage can last up to an hour. An average adult has five to six REM cycles each night. During this final phase of sleep, your brain becomes more active. This is when most dreaming occurs, your eyes jerk quickly in different directions (hence, the name! ), heart rate and blood pressure increase, and breathing becomes fast, irregular, and shallow. REM sleep plays an important role in learning and memory function, since this is when your brain consolidates and processes information from the day before so that it can be stored in your long-term memory (3). As you can see, sleep is a systemised, complex interplay of renewal and regeneration, which needs 7-9 hours to complete its cycle, requiring time spent in all phases, most importantly the Delta phase and cycles of REM. So, what happens when we don’t get enough sleep? Well, a study conducted by researchers at the University of Chicago concluded that sleep loss was found to modify energy intake and energy expenditure (4). They took test subjects put them on a calorie restricted diet. In one phase of the study, subjects were sleep deprived. Allowed only five and a half hours of sleep per night, researchers tracked all their metrics with their fat loss (what's great about this study is they were measuring fat loss, not just weight loss). In the second phase of the study, the same subjects ate the exact same calorie restricted diet, but they allowed them to get sufficient sleep, which was eight and a half hours. Here's what they found… After compiling all the data, when individuals got adequate amount of sleep, they lost 55% more body fat, actual fat mass, just by getting more/better sleep! What’s surprising is they also found there was a loss of fat-free body mass of 60% when subjects were sleep deprived. In other words, their weight loss amount was not coming from fat. They were also losing muscle! So, being in a state of sleep deprivation, you might be losing weight, but are you losing actual fat? Or, are you setting yourself up for some metabolic problems later? Muscle is really your body's fat burning machine, and can have a negative implication on your metabolic function and fat loss goals. The American Academy of Sleep Medicine shared remarkable findings from a study that tracked visceral fat accumulation using a CT scan for a five-year period. Now listen to this… The results found that subjects who slept less than six hours a night over the course of the five years had a 32% gain in visceral fat, (the dangerous fat that builds up around our organs) this is compared to those who slept for more than six hours per night, and they had 13% increase on average (5). Gee, so we’re losing muscle and getting fatter, with dangerous visceral fat accumulation, all by not getting enough quality zzz’s and allowing for these very important sleep phases to complete their function. That’s not all that happens either, if we continuously short change our 7-9 hours’ worth of sleep, we will soon suffer the consequences affecting everything from your vibrant look to being more prone to sickness, an inability to think straight, or remember things, poor libido, higher risk of diabetes, increased risk of heart disease and increased risk of cancer (6–11). This is a big deal! So how can we make more of an effort to get this quality 7-9 hours of sleep that we now understand we need? Well, I’ve got a few ideas that might help you to prioritise those zzz’s to start getting more sleep and waking up more refreshed and ready to tackle the day. Light: decrease/reduce light exposure as much as possible. Do try to have a curfew on electronics that emit a blue light as this interferes with our natural circadian rhythm. Or, you can invest in some nifty blue light blockers like these swanwick ones to wear if you prefer to work in the evening. No caffeine or stimulants after lunch: Coffee and other stimulants have what’s called a half-life which is the number of hours it takes to move through the body after its ingested. Depending on whether you are a fast or slow metaboliser, you will find each cup (depending on the strength of the cup) can last anywhere from 4-8 hours in your system. Multiply that by the amount of cups you’re drinking and it’s no wonder your having anxiety attacks in the middle of the night. Increase light exposure in the morning. This will help elevate cortisol and encourage a better circadian rhythm over time (12). These are some of many tips and helpers I have up my sleeve to help my clients create better sleeping routines and more supportive habits, which as we now know, are crucial to our health, our weight and our overall functioning. I hope this has helped you in your understanding of the importance of sleep. If you feel like you may need more help on how you can optimise your sleep, nutrition or any of the other blogs I write about give me a call. I’ll be more than happy to chat to you.